By 1900 Case had added the Electrical Laboratory for electrical engineering and a small observatory for astronomy to its campus. WRU added 4 buildings for Adelbert College (Hatch Library, Physics Building, Eldred Hall, and the Biology Building  known as DeGrace Hall since 2001). The addition of these buildings was necessitated by the increasing enrollment. In 1890-1891 Adelberts enrollment was 80. In 1900-1901 the enrollment was 198. The new laboratory buildings (Physics and Biology) were also used by the women students for their science classes. A building was also completed for the Law School. This was the first building built exclusively for the Law School. The School had been housed in the Ford House previously. Number of buildings in use by Case in 1900: 6. Number of buildings in use by WRU in 1900: 19. This map features the Adelbert and Case campuses. Adelbert added 4 new buildings since 1892. The sidewalk running north and south parallel to Adelbert Road was known as the Adelbert Walk. Case added the small observatory situated between the Chemical and the Mechanical Laboratories. Here you see a view of the Case campus taken from the roof of Adelbert Main. From left to right are: Electrical Laboratory, Mechanical Laboratory, Chemical Laboratory, 1892, and Case Main. A print of the Adelbert campus. 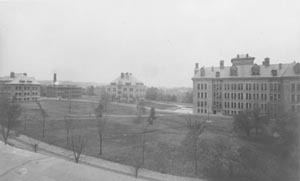 You see, left to right, Hatch Library, Adelbert Main, Physics Building, Biology Building, Adelbert Hall (dormitory), and Adelbert Gym, 1888. In the foreground is Eldred Hall. In this image, Eldred has been rotated 90 degrees. The front entrance actually faces Physics and Biology. A view of the College for Women campus taken from Bellflower Road. Left to right are: Harkness Chapel, Clark Hall, Haydn Hall, and Guilford House.